1. 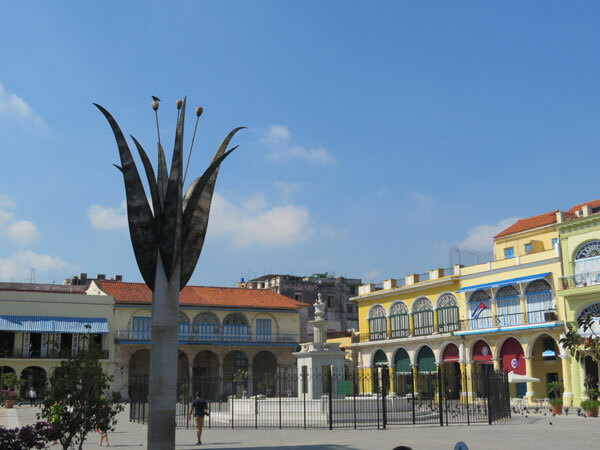 Plaza Vieja - One of the central plazas in Havana, this beautiful architecturally eclectic square is a World Heritage site built in 1559. All the buildings in this plaza have been refurbished. There's a fountain in the middle of the plaza which is surrounded by a micro-brewery, art galleries, cafes and a school. The statue is of a woman riding a rooster holding a giant fork. There are a few restaurants with balcony seating surrounding the square. 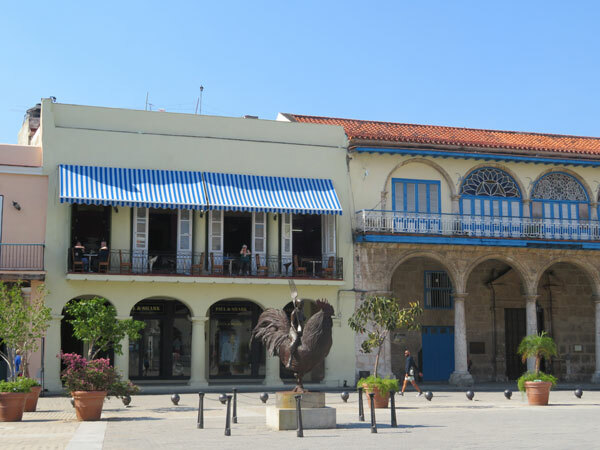 At the corner of Plaza Vieja is Cafe Taberna where you can listen to live Cuban bands at night. 2. El Capitolio -This grand 1920s building is a replica of Washington, DC's Capitol building but is slightly bigger. Is was the former congressional building but was closed in 2010 for renovations. Since it towers other buildings, you can see it from many points in the city so you can use it a marker to figure out where you are. 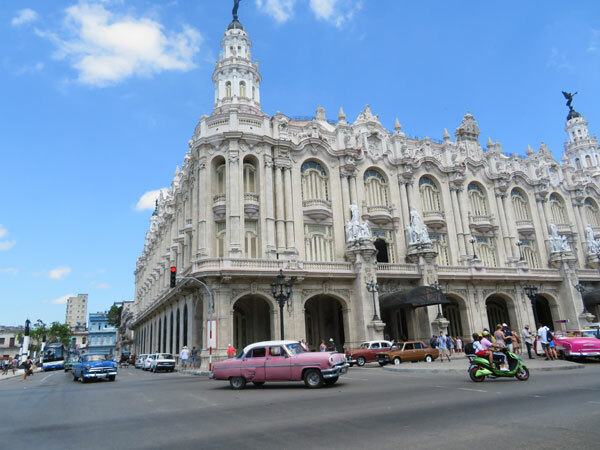 Across the street is the Gran Teatro de La Habana which houses the Cuban National Ballet. 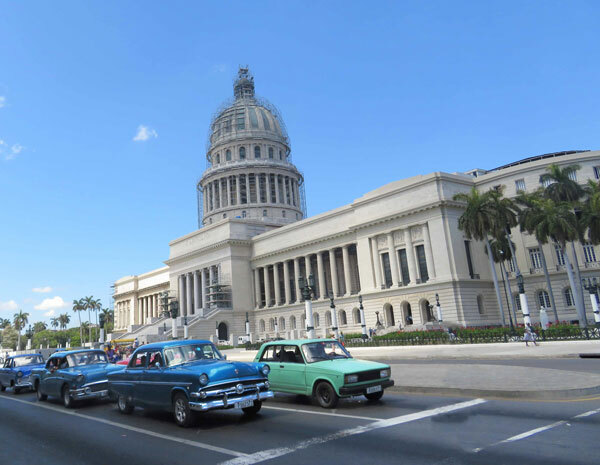 The area around the Capitolio acts as a central traffic hub for the city so you will see plenty of communal taxis, classic cars, and horse carriages waiting for tourists. The $10 hop on hop off bus tour also has a stop here. You can see from my pictures it felt like stepping into an Old Hollywood movie set to see all the classic American cars from the 1950s, iconic models that have banished from the US. 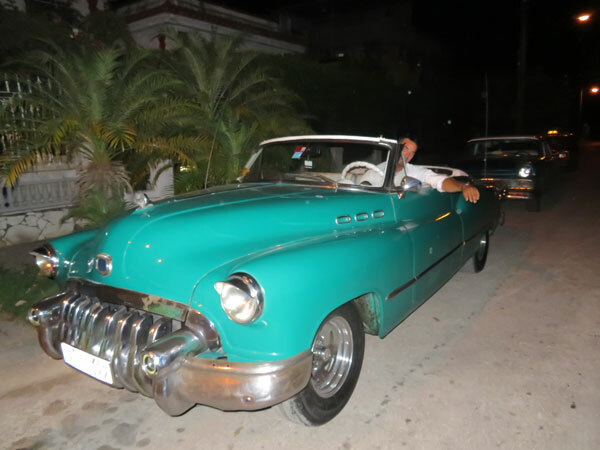 Seven years ago I threw a Havana Nights party where I made everyone wear purple and the invite was of a purple classic car. 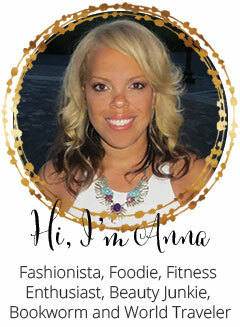 I served mojitos and chocolate cigars. 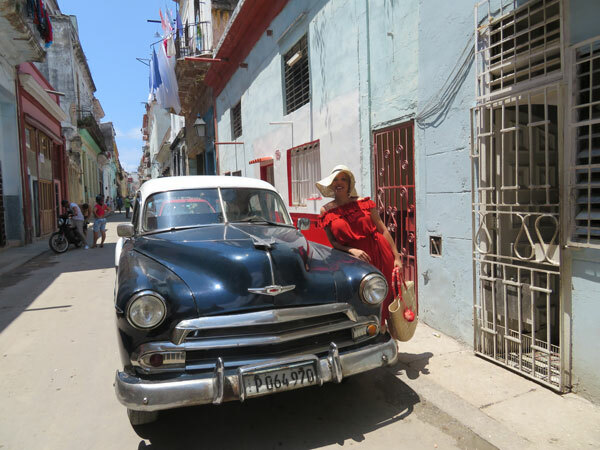 At the time never dreamed I would ever go to Cuba since it had been off limits to Americans. 3. 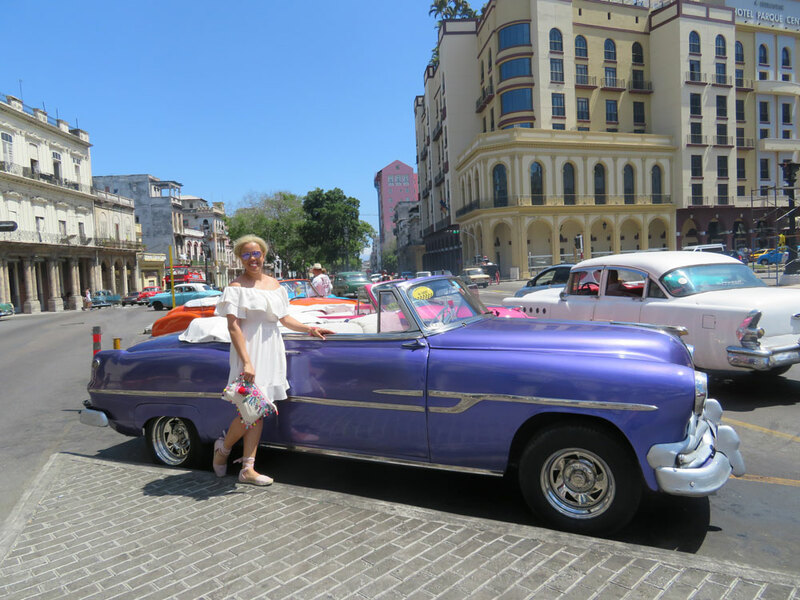 Classic 1950's Convertible Cars - For me the biggest trademark of Cuba is their glorious collection of antique cars from the 1950’s. 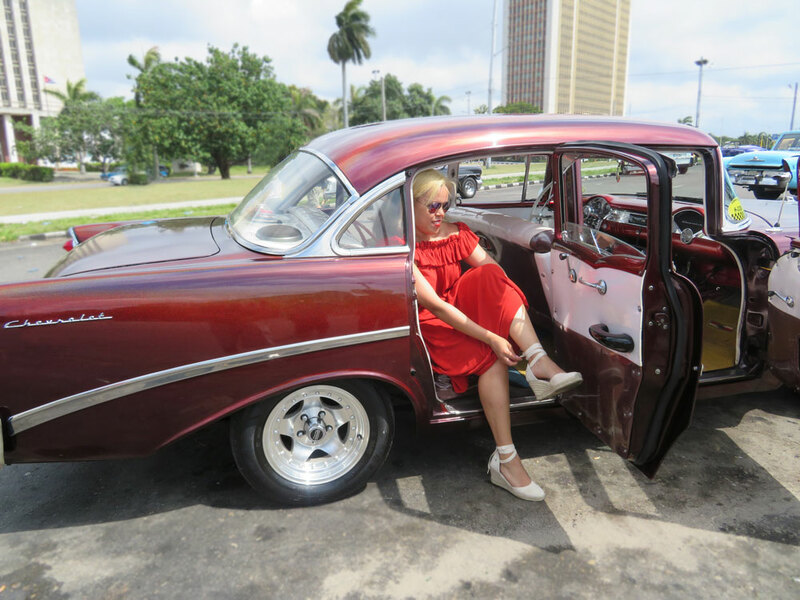 Cuba has 70,000 of these cars still operating and many covered with house paint, no seat belts and the engines replaced with new diesel engines since that's cheaper than gas. The classic cars are used as taxis and taxi drivers have the highest income making $600 a month compared to $25 a month for everyone else. We took a ride in a classic car one evening and it was really strange riding in the front seat of a car without a seat belt! 4. 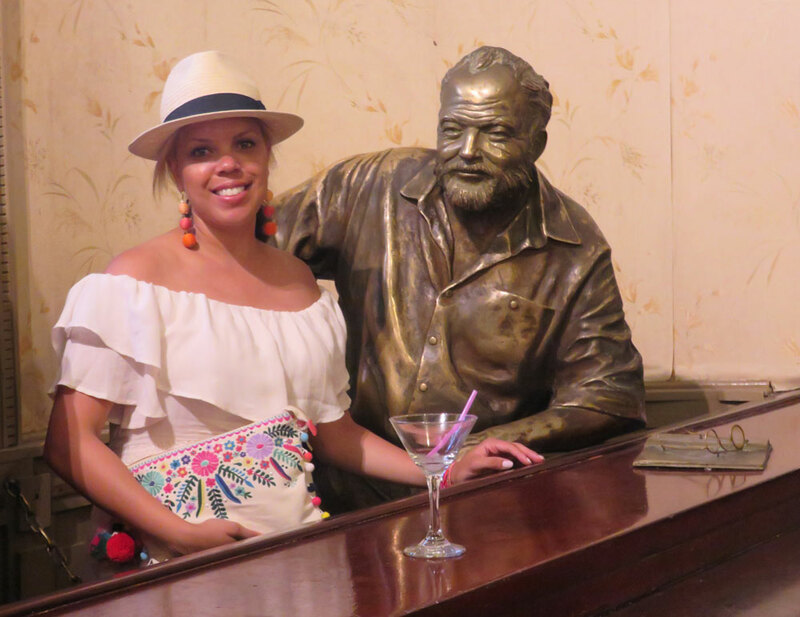 Ernest Hemingway – The author lived in Cuba for 20 years and La Floridita was his favorite bar in the 1930s. At the bar is a life sized bronze statue of Hemingway on his favorite bar stool and the walls are filled with black and white photographs of famous people who have visited. The bar was filled with tourists while a local band played music for us. The daiquiri is the drink to order here that they make in many different ways. In the suburbs of Havana you will find Hemingway’s house and the fishing village he frequented with his boat– Cojimar. 5. 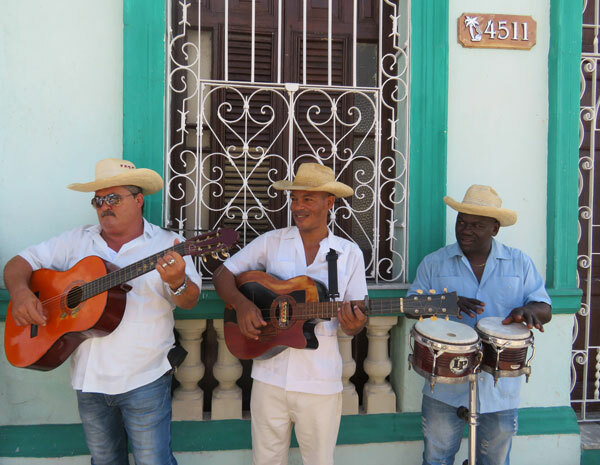 Music - Expect to hear the song "Guantanamera" everywhere you go because it's the best known Cuban song and most patriotic song as the lyrics come from a poem by the Cuban poet José Martí. He's the Cuban national hero and so many things in Cuba are named after him including the Havana airport. Then I'm sure you've heard that Justin Bieber song "Despacito", well the original version is super popular in Cuba right now. Check out my playlist at the bottom of this post. 6. 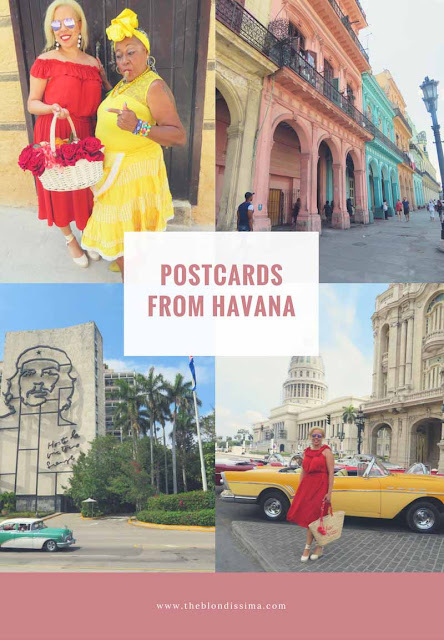 Tropicana Show - I read that Havana has as many cabaret shows as Las Vegas! 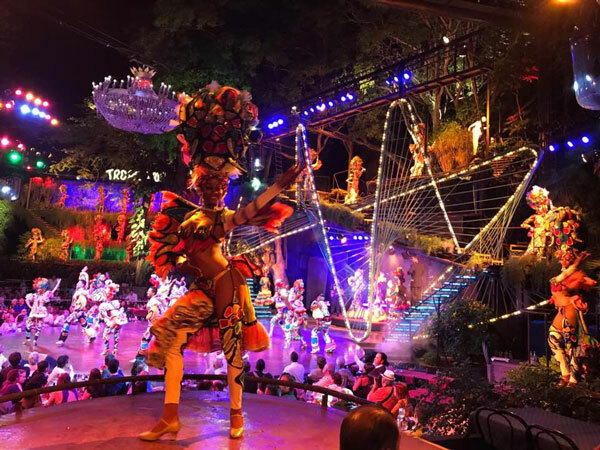 The Tropicana cabaret show is an iconic Cuban show that has been around since 1939. The vibrant costumes are extravagant, especially the heavy headpieces! This is definitely an iconic, must see experience. For $75 we sat in an outdoor theater, the show begins at 10pm and lasted 1.5 hours. The ticket price included a bottle of champagne for the table, peanuts, and Havana Club rum of course, more than we could drink. Men get a cigar. If you want to take pictures of the show that costs extra. 7. 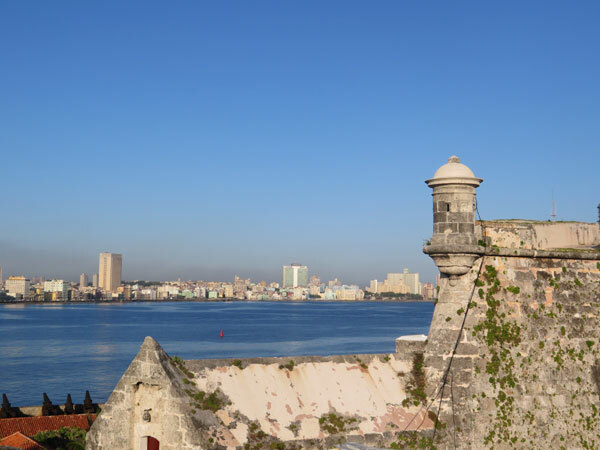 Morro Cabańa - For a sunrise view we visited the Fort just across the bay from Havana. 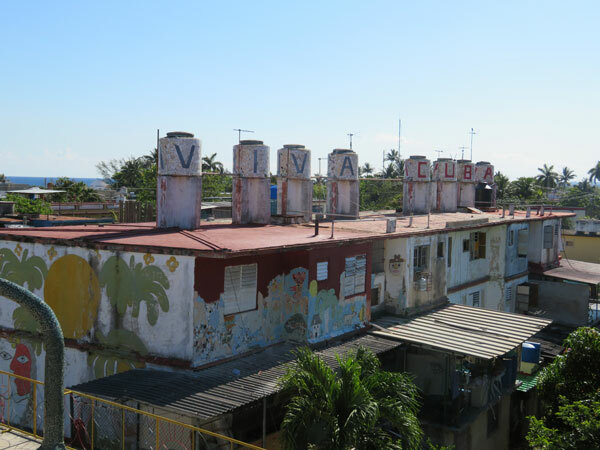 It has a wonderful view of Havana. We saw a cruise ship coming in the narrow harbor channel while we were there which was a sight to see. The fort was built to protect against pirate attacks. Every night at 9pm a cannon is fired. 8. Fusterlandia - Cuban artist José Fuster has turned his neighborhood into a masterpiece of mosaic tiles of every color and description all whimsical and stylized. Fuster’s own house is fully decorated from the ground level to the roof with artwork and all kinds of sculptures. 9. 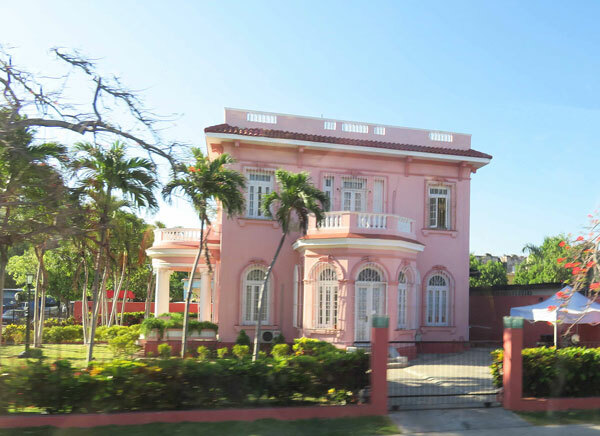 Vedado – This neighborhood is off the beaten path but has some of the most stunning residential architecture. 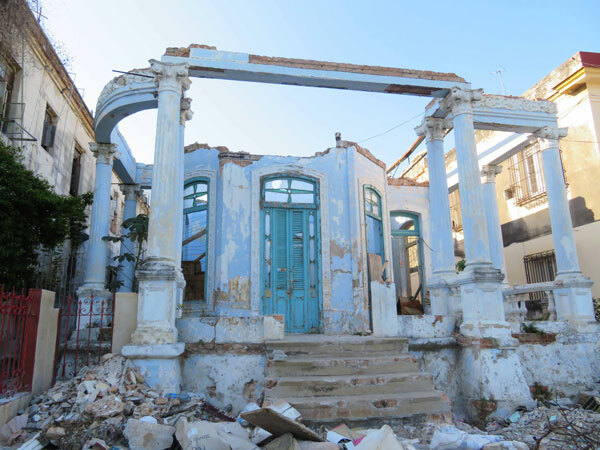 Many mansions were abandoned at the start of the revolution and now are crumbling. 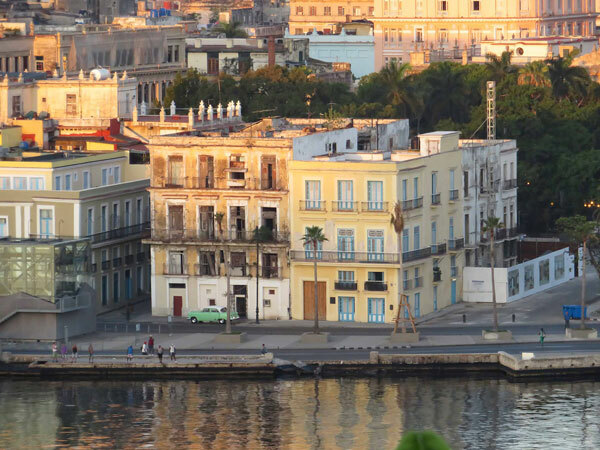 They was once inhabited by American investors involved in Cuba’s sugar industry and some today have been converted into offices. They're a beautiful rich relic from another time. 10. Hotel Nacional – We ended a long day of sightseeing with drinks on the back lawn of the Hotel Nacional overlooking the sea. 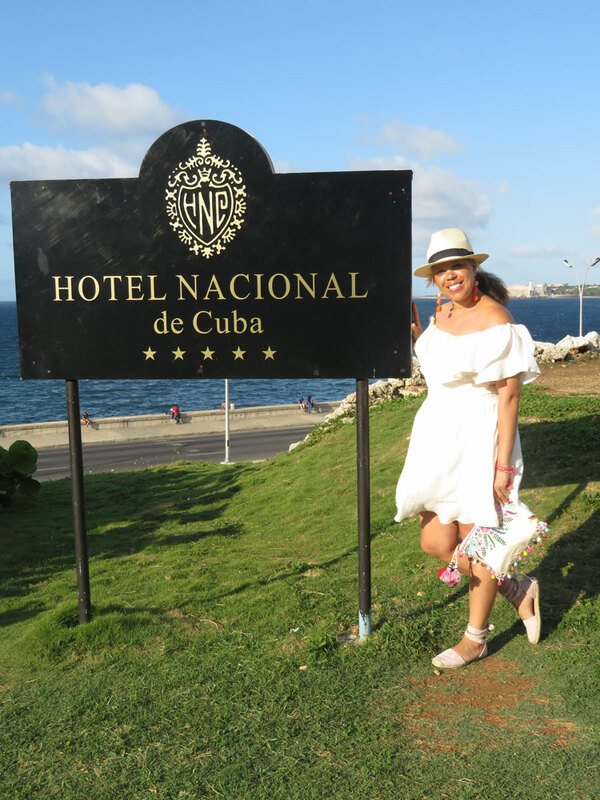 Built in the 1930s, it's Cuba's most famous hotel modeled after The Breakers Hotel in Palm Beach. 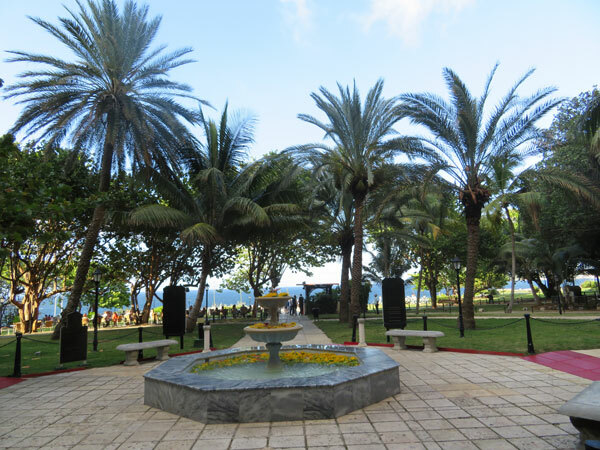 It has a palm tree lined entrance and gorgeous garden in the back where you can sit and stare at the water. This is also the site of the Cuban Missile Crisis and you can still see the tunnels that were once set up with missiles aimed at the US. Key West is only 100 miles away! 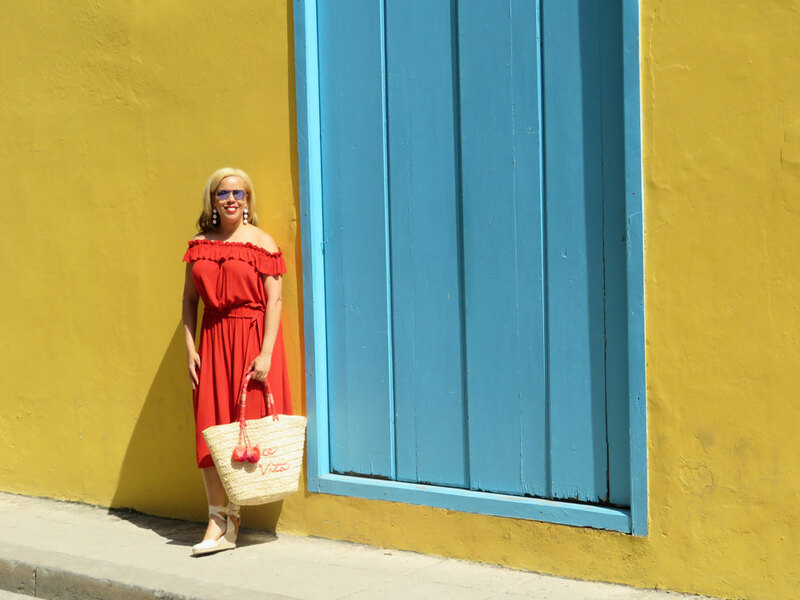 It has the perfect view of the Malecon, the avenue along the seawall that has fantastic sunset views. Great place for people watching as well. Also on the Malecon, I was surprised to see they had an American embassy (but no Ambassador). I was watching the news last night and saw this bizarre story about American diplomats in Cuba. 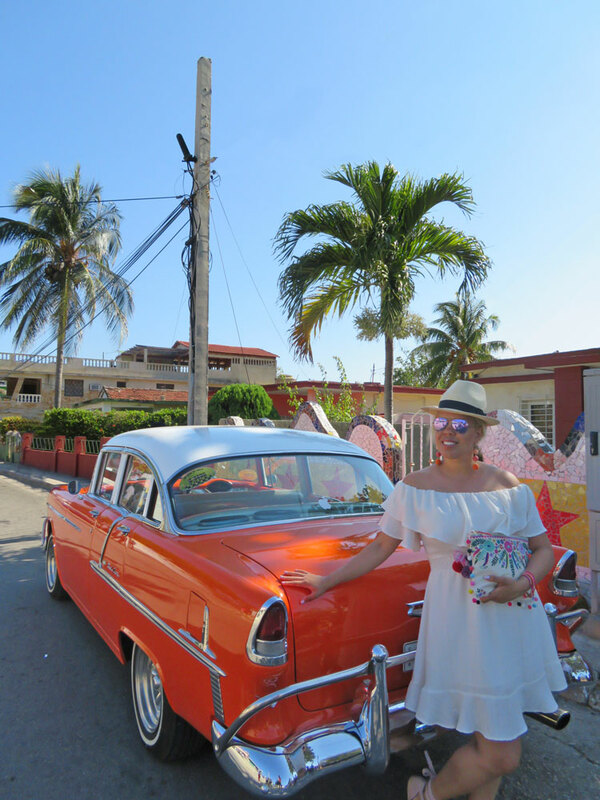 Cuba was one of my all time favorite trips and I'm hoping to go back soon to see more of the island! I'm going out tomorrow night with some friends to see a Cuban band perform. I'm just blown away by all the colors!! I'd love to visit one day. What a great trip! 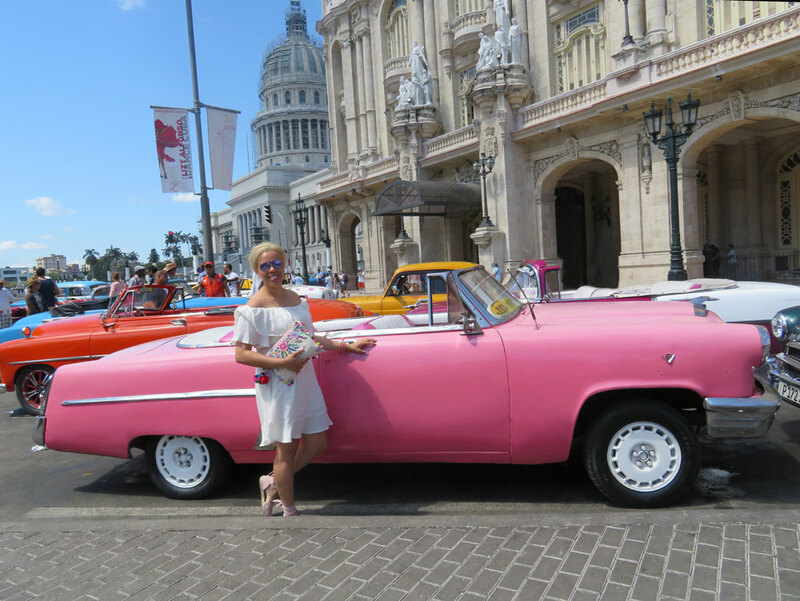 I'd love to visit Cuba - Havana looks like such a fun city! 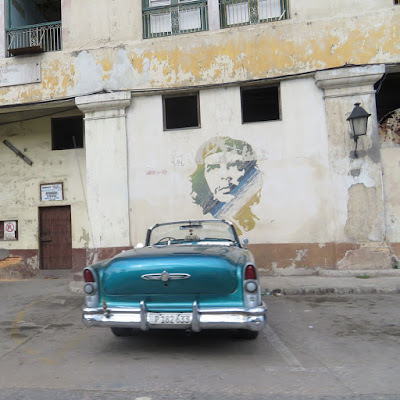 I can't wait to visit Cuba one day. You are so lucky! Look at all of those old cars! What fun! Really, really lovely photos you got there! what an enchanting place and such great photos!! we love traveling and this will be on our list! I cannot wait to go ... love your pictures. The colors are calling out to me. Oh the architecture and colors!! What an experience that must have been! Cuba, you're on my bucket list!!!! 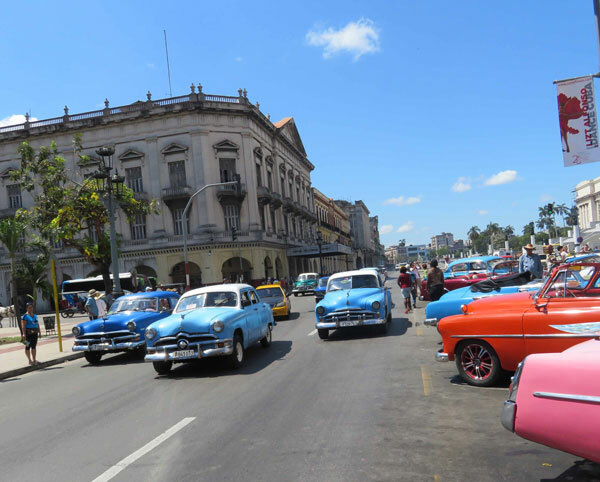 I have always wanted to take a trip to Cuba. The colors are so beautiful - I would love to photograph there! Love details about this interesting place. Not sure if I'd be brave enough to visit but love seeing it all - especially the OLD colorful cars.